What is the difference between a Guest House and a motel? Ulladulla Guest House offers most of the facilities of a large five star hotel with the friendliness and flexibility of a small establishment with dedicated staff to look after Guest requirements. How far are you from Sydney ? 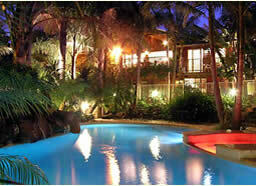 Ulladulla Guest House is 220 km from the CBD. The journey takes under 3 hours (depending on traffic). Can I stay one night or do you have a minimum stay? One night stays are accepted midweek (Sunday to Thursday). On weekends we offer special 2 night packages but please call a few days before for availability if you would like a Friday or Saturday only. Is your restaurant fully licensed or can you BYO? Our award winning restaurant, Elizans, is fully licensed and has an extensive wine list featuring local wines, as well as some of the best of Australian and French wines. Do you have bathrobes in the rooms? Bathrobes are provided in our Executive rooms and are available to other rooms on request. Do you have internet access in your rooms? All rooms have a separate telephone socket for internet connection. Do you have spa baths in your rooms? Spa baths are a feature of our Executive rooms. Our establishment does not specialise in family accommodation. However, children are accepted by special arrangement. 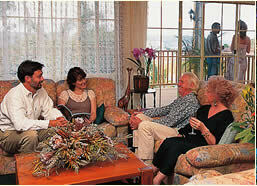 Ulladulla Guest House is located in the town 100 metres south of the harbour. It is not on the beach but is a short walk from a number of secluded beaches and a short drive from some of the most beautiful beaches on the South Coast . "This fabulous property is one of the best places to stay in Australia"
"Great hospitality, a true oasis to stay and enjoy the south coast"
"What you get is an amazing personal touch-it's homely, friendly and peaceful." "A very nice stay in this lovely hotel"
"An easy classy atmosphere and genuine warmth"
"A second wonderful visit, can't wait for the third"
"Tasteful, comfortable and welcoming atmosphere"
"Everything was just right, great food, room and service"
"It is not hard to feel thoroughly spoiled after a weekend at the Ulladulla Guest House"
"A perfect 30 th wedding anniversary thank you"
"The perfect retreat, wonderful service"
"Once again what a wonderful stay"